January 14, 2019 Robert W.
Dust control signs for Las Vegas and Clark County Nevada are sometimes mandated by the Air Quality Management Board in Clark County. Failure to comply with their rules and regulations could result in fines and work stoppage. In Clark County, people take raising dust seriously as they believe in contributes to pollution. There are mandatory classes of instruction, signs that are needed and many other requirements. Dust control signs for Las Vegas and Clark County Nevada are generally two different types, a 4ft x 4ft sign for land less than 10 acres that will be constructed on and a 4ft x 8ft sign for land to be constructed on that is greater than 10 acres. Specific text size and information needs to be on the signs as mandated by the Clark County Air Quality Board. The Clark County dust control signs can be made with different materials such as aluminum or wood. The signs are then placed in a easily visibly spot on the construction site. Some dust signs will have holes punched in the corners and then they are wired to a fence and others require 4″ x 4″ wood posts to hold them up. Dust control signs for Las Vegas and Clark County Nevada are not expensive. The 4ft x 4ft aluminum sign generally sells for less than one hundred dollars and the 4ft x 8ft dust sign generally sells for about one hundred seventy five dollars. The signs are slightly higher if you like to have them made with a wood MDO substrate instead of aluminum. Both aluminum and wood MDO dust signs will last a long time at the construction site. The most common danger they have is when a large piece of construction equipment runs them over by mistake. Contact your local sign company if you should be required to have one on your construction site. December 11, 2018 Robert W.
Cheapest dust signs in Vegas can get you that mandated dust permit sign at a low cost price. Why pay a lot of money for dust signs when you can get them low priced right here in Las Vegas ? The Air Quality Management Board in Clark County mandates dust signs and dust permits and part of that requirement is having a dust sign that is acceptable to Clark County Air Quality Management. The dust sign has to meet specific language, text ,height and font requirements. Cheapest dust signs are printed on a vinyl application with outdoor ink and then have a protective laminate applied to the vinyl. This helps protect the dust sign from miscellaneous scratches and also protects the ink from fading since the sign will be exposed outdoors for a period of the construction. On larger home development, that can be years and the dust sign is created so that it can be modified when dust signs are extended or updated. The signs are then attached to existing fencing for visibility or are placed in the ground with 4×4 wood posts for support. Cheapest dust signs are under one hundred dollars for the 4ft x 4ft model and $175 for the 4ft x 8ft dust sign on aluminum. Many builders prefer the aluminum because they are lightweight and can be installed by one person. Otherwise the wood MDO dust permit signs cost $125 for a 4ft x 4ft and $225 for a 4ft x 8ft dust sign. These signs are usually next day but in cases of threats by govt. agencies, these signs can be expedited and made the same day. Contact you local sign store for more information. Clark County Las Vegas Dust Permit Signs. June 6, 2017 Robert W.
Clark County Las Vegas dust permit signs are required by the Air Quality Management Board when building in Las Vegas and Clark County. These signs can be found at http://posterhead.com/dust-control-signs/. Information from the Air Quality Management Board can be found at http://www.clarkcountynv.gov/airquality/compliance/Documents/DustControl/DustForms/Sign.pdf. For 10 acres or less, a 4ft x 4ft dust control sign is required and for larger than 10 acres, a 4ft x 8ft dust control permit sign is needed to be posted at the construction site close to the street for visibility. This dust permit sign will contain information such as Permittee, name of the construction project, permit number, contact information and expiration date of the construction project. Clark County Las Vegas Dust permit signs are made two different ways. The easier and modern way is to use a double sided aluminum panel ( with a filler in the middle to make it thick and resistant to damage) or mdo board ( a wood product that is bulky and heavy and subject to deterioration in the weather elements.) Normally, the dust control sign is attached to a outer perimeter fence so it can be seen very easily and abide by the rules set forth by the Air Quality Management Board. Other times, the dust control signs are held up by 4×4 posts in the ground and cross braced because of the heavy winds that Las Vegas Valley has from time to time. The dust permit signs can be made fairly quickly ( same day service can be found) or normally its just a 2 to 3 day turnaround time for the dust permit sign. Many sign companies offer installation of the dust sign if asked. 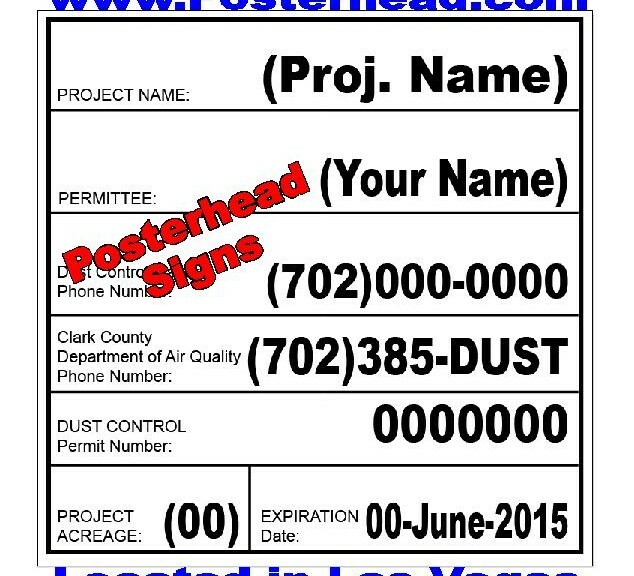 Clark County Las Vegas dust permit signs are available at many sign companies in the Las Vegas area. With turnaround time of just a few days, you will be building your project in no time at all.